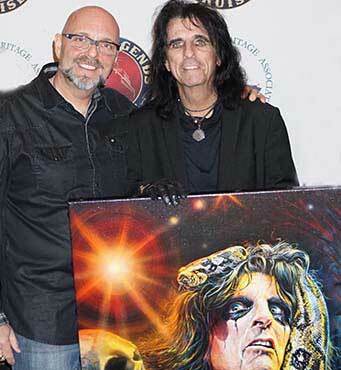 The alice Cooper print “Welcome to My Nightmare” received amazing feedback from fans as well as Alice Cooper himself. One of the moments I treasure the most from this job is being able to show my work and to see the happiness my work gives to others. Alice Cooper wanted to know what techniques I used, what kind of paint, he was full of questions which I was more than happy to answer. During the time we spent with him he told us a story I’m happy to share with you. For every show, the great Mr. Alice Cooper uses a different snake. The snake gets to fly first class with its own special cage, heating pad and special lights, anything to make the journey as comfortable as possible. Unfortunately, the snake was hungry during the flight and when Alice went to go check on his snake, he noticed that instead of his tongue coming out from his mouth he saw an electrical cord. The snake had eaten the heating pad with it still being plugged in. Once the plane had landed they took the snake over to an animal hospital where he underwent surgery. Thankfully the snake pulled through and now lives a glorious life in a beautiful zoo.